Adjuncts at Miami Dade College are part of a statewide movement calling for union rights for adjunct professors, fully-funded free college, student loan forgiveness and $15 and a union for all campus employees. On Tuesday, September 18, Miami Dade College adjunct faculty, along with students and community groups, rallied in support of union rights for adjunct professors and free college for all Floridians outside of a Miami Dade College board of trustees meeting. Adjuncts at Miami Dade College filed for a union back in July, joining their colleagues throughout the state by coming together to improve wages, job security and access to quality education by organizing for change across Florida’s higher education system. Adjuncts at Miami Dade College also protested Miami Dade College’s mismanagement of tuition funding. Over the last decade, Miami Dade College’s administration has raised tuition by 40 percent yet it invests less in instruction per student than most other colleges in Florida. It also has the highest share of faculty working part-time and with little job security of all 28 institutions in the Florida College System. In 2016, 80 percent of faculty at MDC were contingent and off the tenure track. Years of austerity in Tallahassee have resulted in a broken higher education system that leaves too many in debt and poverty in Florida, adjunct professors say. The state is ranked 50th in the nation for investment in public services and has seen substantial cuts to education. Higher education funding is down by more than 23 percent from a decade ago, while tuition is up by 62 percent over the same period. Today, Floridians hold nearly $80 billion in student loan debt and adjunct professors are paid so little that many have to rely on government assistance. While Florida has become a symbol of challenges in the higher education system, it has also become the center of a growing movement to organize for change. Over the past two years, adjunct professors at Hillsborough Community College, Broward College, and University of South Florida have formed their unions. 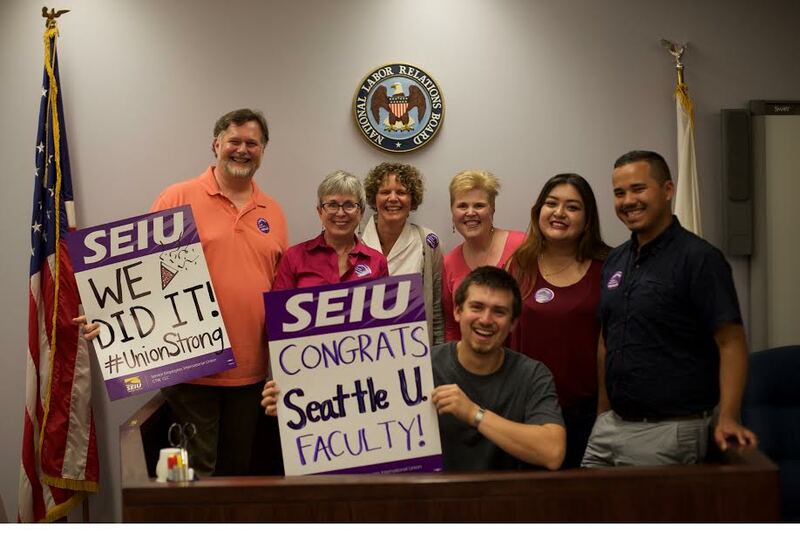 Faculty at Valencia College, Seminole State College and Miami Dade College recently filed for their unions and others are actively organizing across the state. These adjuncts, who are part of the growing SEIU Faculty Forward movement, have called on political candidates at the gubernatorial debate and town hall meetings in Tampa, St. Petersburg and Miami to commit to reinvesting in students and educators alike by supporting free college. Democratic gubernatorial candidate Andrew Gillum recently endorsed unionising efforts by adjuncts and joined adjunct faculty from across the state this summer to deliver food to Miami Dade College’s food bank, which serves students and faculty in need. Stay in touch and join our email list today!